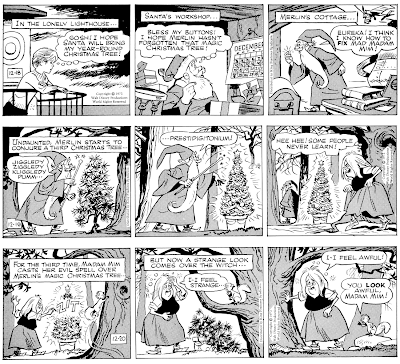 Here for your holiday enjoyment is presented The Magic Christmas Tree, the 1972 Christmas comic strip distributed by King Features. Art is by John Ushler, story by Frank Reilly. 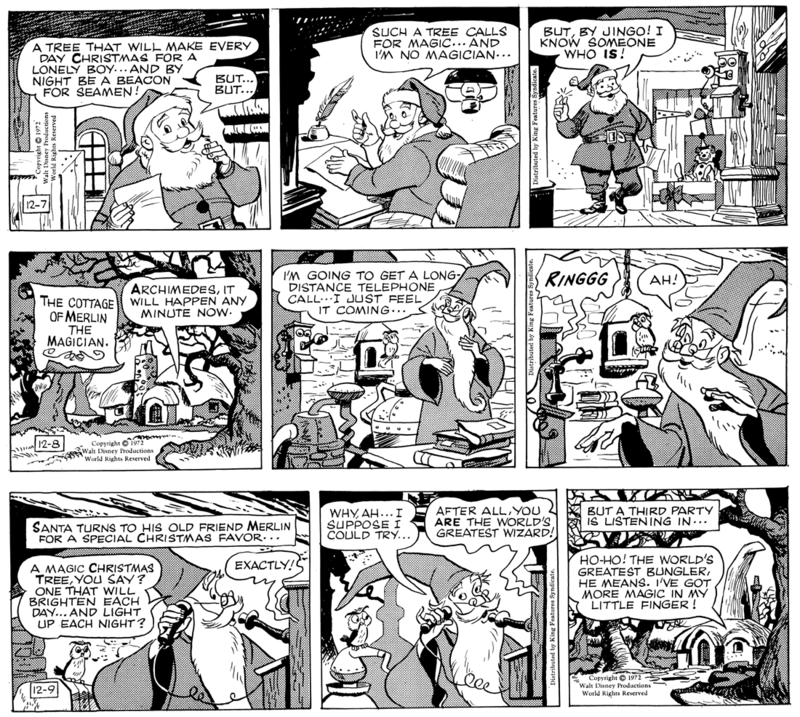 The strip originally ran in newspapers from December 4 to the 23rd 1972. 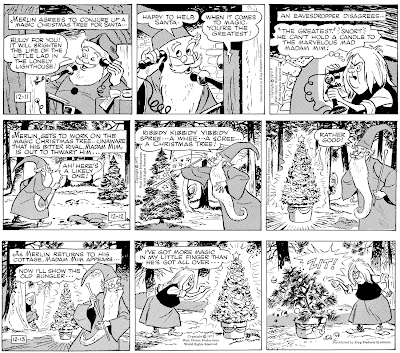 When did special Christmas strips fade away? For that matter, did many papers run them? 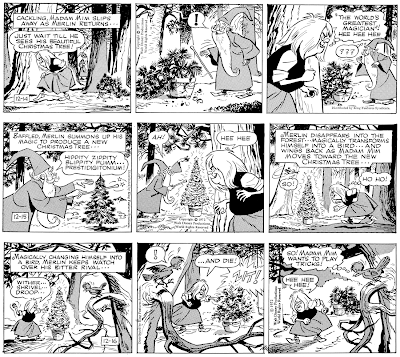 I recall seeing samples of a Disney strip involving Peter Pan; I assumed it was part of a marketing campaign for a release/re-release of the movie. On one of the syndicate sites a few years back there was a mildly grown-up fairy tale that turned out to be the launch of "Pibgorn". 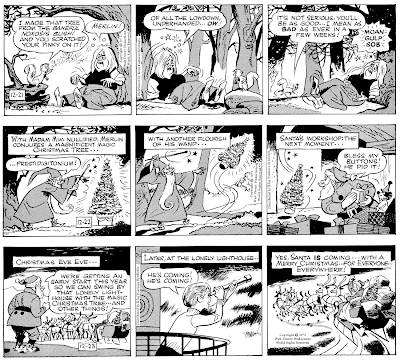 But in several decades of comic-reading I don't remember any Christmas-only strips appearing in the San Jose papers (or the Sunday SF Chronicle). Frankly, they were never what I would consider overwhelmingly popular. Not a lot of papers ever took advantage of the Christmas freebies, probably because it meant finding a space for it in the paper for a month. Putting it on the comics page was a problem because that page is basically preset, and putting it on news pages -- well, that's a bit weird. The layout hassle probably didn't seem worth it to a lot of papers. 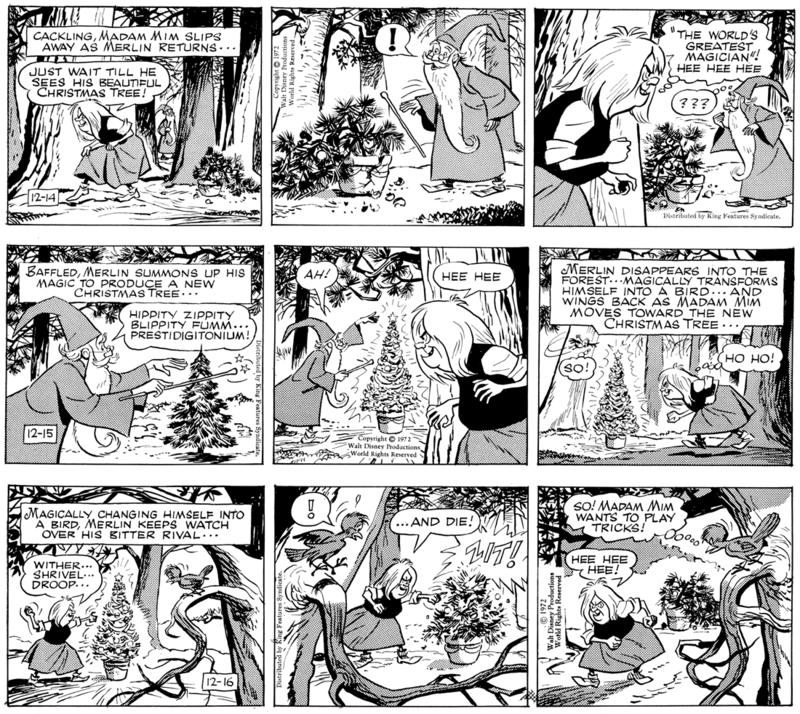 Especially when December is very busy, layout-wise, with Christmas advertising. 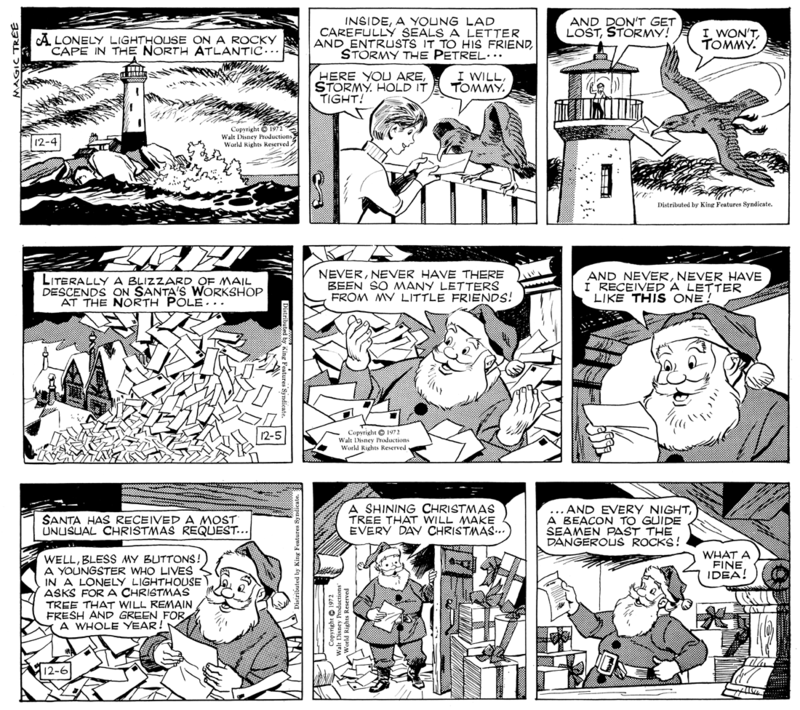 Although never really all that popular in the first place, the Xmas strips become more and more rarely run by papers starting around the mid-50s. By the 1980s finding a paper that was running them is very tough. 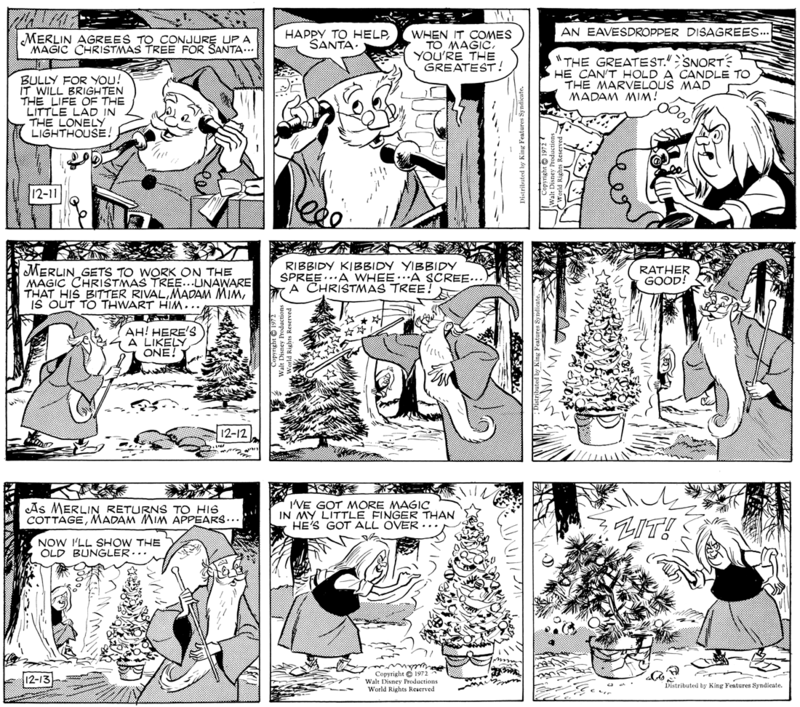 The last of the Christmas strips were those issued by NEA, and even they often just reissued old ones for the past twenty-some years (there's a post on this blog with the list). Last year was the final one offered by NEA (another reprint). This year, Universal, which now owns the syndicate, said they wouldn't be issuing one. And I very much doubt they'll change their mind in coming years. 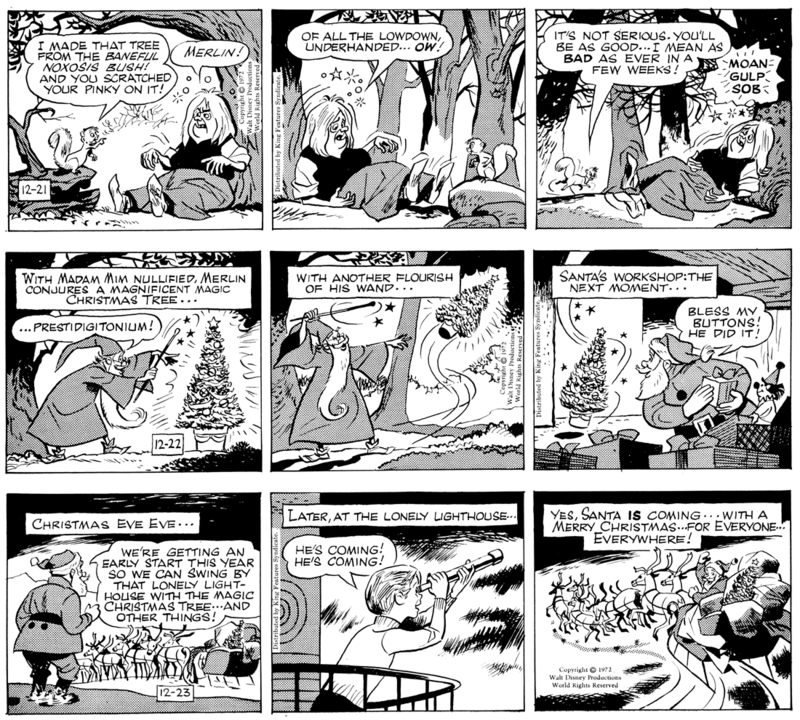 Rip Haywire was the last feature used for the NEA Christmas strip. It was called "Away in the Danger." 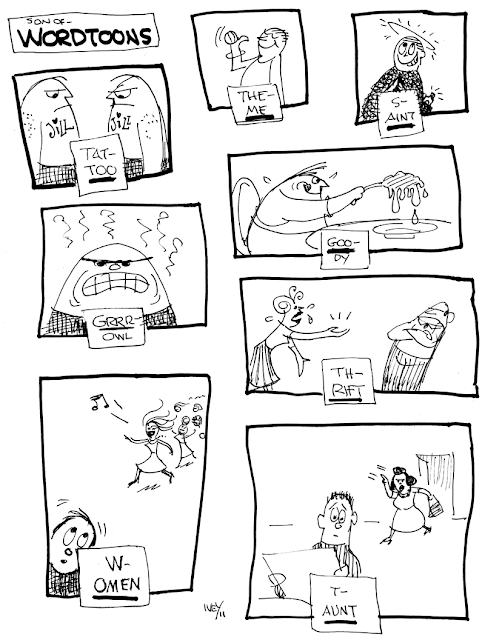 I heard about one editor who replaced MUTTS and ran the holiday strips. He swore never to do that again after the backlash. 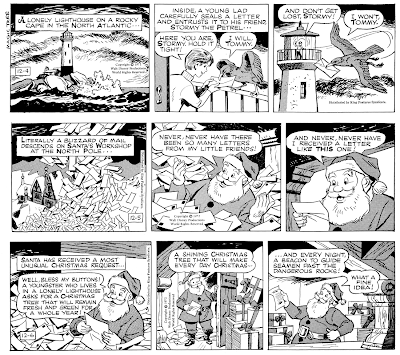 When the papers spread out their features like in the 40's and 50's this was a nice addition to a newspaper for the holidays, but not in today's smaller formatted papers. On the plus side the on-line fans love the extra holiday stuff with their favorite characters. I'm just glad I was able to do one before it ended, as it was on my to do list. Wow! Great list, Allan. 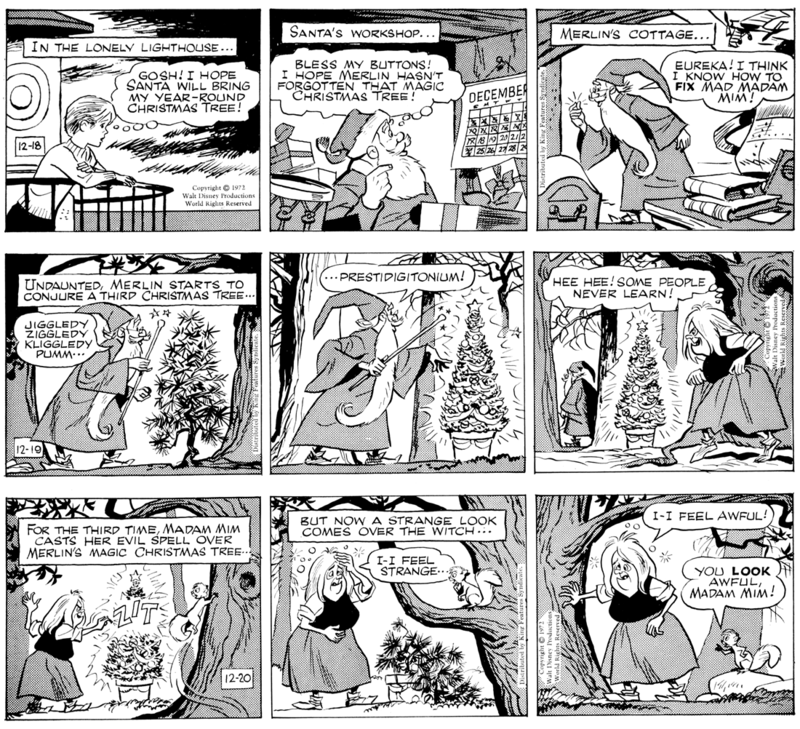 Cartoonist Profiles had a nice article with samples of some of the NEA Christmas Strips...it was something I had always dreamed of doing...Glad I got to. Happy Holidays, Allan. A footnote. 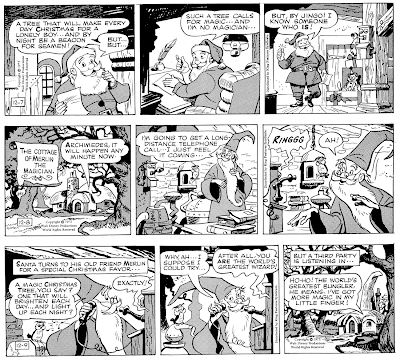 By a fantastic coincidence, Disney re-released "The Sword in the Stone" -- the source for the Merlin and Madame Mim characters -- that same year on Dec. 22. Actually, Universal Press has been running a daily "Peanuts Holiday" panel, and at least one paper the panel ran last year (2012) in the front page. Jim, the wordsmith, strikes again! Love 'em. For some reason the "tat too" drawing made me really laugh - those mugs are funny!